When convenience is a must, 10x10 pop up booths are the best choice for exhibitors always on the move! Pop Up Displays are lightweight, portable and easy to assemble. These versatile display booths work well for small trade shows, conventions and media events. Magnetic Pop Up Display Packages come in many free-standing display models and small popup table kits. 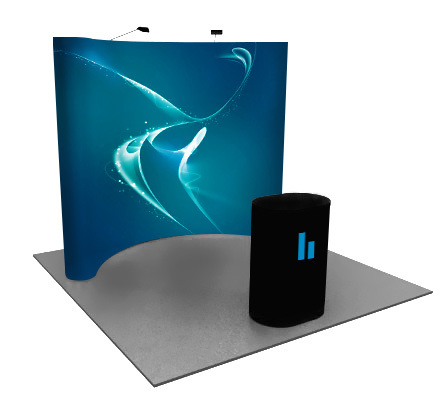 The traditional pop-up display is one of the classic low-cost, portable trade show displays. 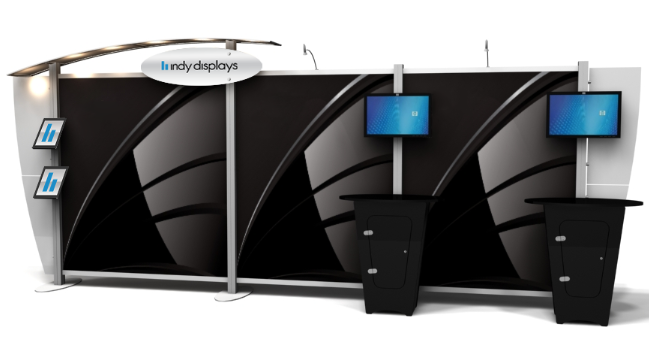 Indy Displays proudly offers economy and premium pop-up display systems. Choose from fabric pop-up display kits and graphic pop-up display kits. We understand how important of a customer's trade show booth is. Exhibit booths need creative graphics, proper display lighting, and a sense of depth in their exhibit booth. Trade show booths don't have to be just a standard 10-foot pop-up display. There are a number of size and shape options available, plus custom built displays that are smaller, taller, and wider than standard kits. Indy Displays offers a variety of trade show booths designed to meet your needs and stay within your company budget. Our Custom Exhibit Line and Xrline Displays come in a 10' x 10' display kit sizes as well as 10' x 20' and 20' x 20' displays. We also offer trade show booths that utilize both laminate and fabric; our Exhibit Line and Xrline Series mix tension fabric and laminate panels to create a high-end custom exhibit look.